Living in beautiful Sonoma County, we are able to garden twelve months of the year. There are many nutritious fall and winter crops that can withstand light frost and that improve in taste by concentrating sugars in their tissues when frost occurs. After November 17, we have less than ten hours of daylight—when crops significantly slow or stop growth. If we bring hardy cool season crops to maturity or near maturity by this time, they can be harvested throughout the winter. A predicted hard freeze or extended period of frost may require plant protection (e.g., frost cloth). But, not everyone chooses to plant a succession garden after a long spring and summer-into fall growing season. In this case, it’s time to put the garden to bed. Think of it as pulling up a comfy blanket to “tuck in” your soil and the beneficial organisms who reside there. Save seed of your favorite open-pollinated (heirloom) crops assuming there still are, for example, ripened tomatoes and dried bean pods on the vines. Remove spent crops. Place diseased and insect-infested plants in the county green bin (which will undergo a hot compost process). You can place other plant residue in your own compost pile. One option is to leave healthy roots in the soil, and “chop and drop” the spent crops on the surface of the soil—both will rot and feed the soil. These actions support the concept of conservation agriculture. You are not disturbing the soil organisms and you are encouraging a soil structure that will retain moisture. Know your community rules which may not allow plant residue being left in the garden. Many of our food crops are heavy feeders requiring that we amend the soil. Depending on the amendments added during the growing season, lay one to two inches of quality compost on top of the soil. No need to dig it in—Mother Nature will take care of this over the winter. Or you may add aged manure or other organic material to the top of the soil. A layer of organic mulch (hulls, shredded leaves, grass clippings, rice straw, shredded newspaper, shredded bark) will protect your topsoil and soil amendment from being washed or blown away during the winter. 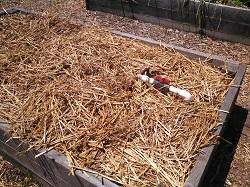 If you add a thick enough layer (3-4”), the mulch will suppress weeds. Do not use materials that were subject to pesticides when they were living. Also, if you are growing fall/winter crops, mulch will reduce soil borne disease that splash can spread; keep mulch one inch away from the plant stems to prevent root diseases. If you hurry, you may have time to plant a cover crop. A legume crop (e.g., fava beans) can fix nitrogen in the soil, improve soil structure, prevent weed growth and protect topsoil from erosion. And don’t forget that snails and slugs make an appearance when the weather cools, especially if you are growing cool-season crops. Overturn a flowerpot where there is evidence of their slime; find them inside in the evening or early morning and crush them. Otherwise, they will be there to feast on next year’s spring crops.